List of Byzantine Emperors courtesy of Wikipedia. Empress Theodora - Ancient Champion of Women's Rights. 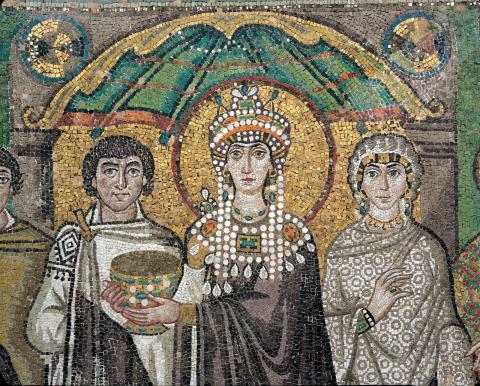 Theodora was one of the most-influential women of the ancient world. She was a champion of women’s rights. She had laws passed which prohibited the trafficking of young girls and changed existing laws impacting divorce to give more benefits to women. Awesome Stories. 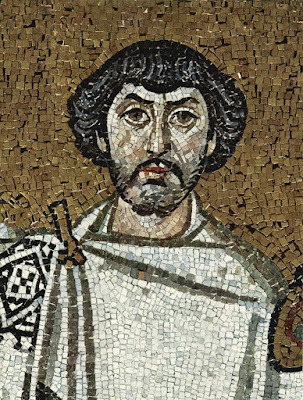 A figure thought to be Belisarius from the mosaic in the Church of San Vitale in Ravenna, Italy. NeoByzantium.com – The Guide to the Byzantine Empire for General Readers. The purpose of this site is to provide coverage on the Byzantine Empire for the general reader. The aim is to do so in a manner that is informative, entertaining and easy to read. Late Antiquity : A Guide to the Postclassical World. G.W. Bowersock, Peter Brown, Oleg Grabar, editors ; research assistants, Michael Gaddis ... [et al.]. Cambridge, Mass. : Belknap Press of Harvard University Press, 1999. 78pp. Main Library DE5 .L29 1999 : By extending the commonly accepted chronological and territorial boundaries of the period--to encompass Roman, Byzantine, Sassanian, and early Islamic cultures, from the middle of the third century to the end of the eighth--this guide makes new connections and permits revealing comparisons. Consult the article on "Angels" and discover their meaning in Islamic as well as classical and Judeo-Christian traditions. Refer to "Children," "Concubinage," and "Divorce" for a fascinating interweaving of information on the family. Read the essay on "Barbarians and Ethnicity" and see how a topic as current as the construction of identity played out in earlier times, from the Greeks and Romans to the Turks, Huns, and Saxons. Turn to "Empire Building" to learn how the empire of Constantine was supported by architecture and ceremony. Or follow your own path through the broad range of entries on politics, manufacturing and commerce, the arts, philosophy, religion, geography, ethnicity, and domestic life. Each entry introduces readers to another facet of the postclassical world: historic figures and places, institutions, burial customs, food, money, public life, and amusements. A splendid selection of illustrations enhances the portrait. Late Antiquity : a very short introduction / by Gillian Clark. Oxford : Oxford University Press, 2011. 128pp. Main Library D57 .C53 2011 : Late antiquity saw the barbarian invasions overrun the western Roman empire and Persian and Arab armies end Roman rule over the eastern and southern coasts of the Mediterranean. Was late antiquity therefore merely a time of decline? In this vibrant and compact introduction, Gillian Clark sheds light on the concept of late antiquity and the events of its time, showing that this was in fact a period of great transformation. Late antiquity saw Roman law codified, Christian creeds formulated, the Talmud compiled, and the Qur'an composed. If the Goths sacked the city of Rome, the Vandals built churches in Africa and Attila the Hun received an embassy from Constantinople. Anthony of Egypt and Simeon Stylites offered spectacular new models of holiness, while Augustine and Basil and Benedict devised rules for monastic communities. Late antique artists produced the mosaics of Ravenna and the first dome of Hagia Sophia. And it was also the period when emperors Diocletian in the third century and Justinian in the sixth enacted extensive and much-needed reforms of government. Cambridge History of the Byzantine Empire Online, 500-1492. / edited by Jonathan Shepard. Cambridge, UK ; New York : Cambridge University Press, 2008. Main Library DF571 .C34 2008 (Also available online) : Byzantium lasted a thousand years, ruled to the end by self-styled 'emperors of the Romans'. It underwent kaleidoscopic territorial and structural changes, yet recovered repeatedly from disaster: even after the near-impregnable Constantinople fell in 1204, variant forms of the empire reconstituted themselves. The Cambridge History of the Byzantine Empire tells the story, tracing political and military events, religious controversies and economic change. It offers clear, authoritative chapters on the main events and periods, with more detailed chapters on particular outlying regions, neighbouring powers or aspects of Byzantium. With aids such as a glossary, an alternative place-name table and references to English translations of sources, it will be valuable as an introduction. However, it also offers stimulating new approaches and important new findings, making it essential reading for postgraduates and for specialists. A Companion to Byzantium / edited by Liz James. Malden, MA : Wiley-Blackwell, 2010. DF552 .C63 2010 Online : From the time Constantine the Great moved the imperial capital from Rome to Constantinople in 330 AD, until its fall to the Ottoman Turks eleven centuries later, Byzantium flourished as the most powerful empire in the world. The Eastern Roman Empire not only exerted profound influences on neighboring civilizations, but also reinterpreted Greek and Roman culture within its own distinctive Christian framework....Recent scholarship has transformed the field of Byzantine studies and propelled it to the forefront of academia. Building on these recent developments, A Companion to Byzantitun presents some different angles on the empire. In 27 original essays, leading scholars from around the globe explore fascinating new approaches, areas of research, and methodologies on such topics as memory, the emotions, childhood, and beauty. A Companion to Byzantium sheds new light on the complexities of Byzantium and points to its legacy in contemporary culture. A Companion to Late Antiquity / edited by Philip Rousseau ; with the assistance of Jutta Raithel. Chichester, U.K. ; Malden, MA : Wiley-Blackwell, 2009. 709pp. DE86 .C63 2009 Online : An accessible and authoritative overview capturing the vitality and diversity of scholarship that exists on the transformative time period known as late antiquity. Provides an essential overview of current scholarship on late antiquity – from between the accession of Diocletian in AD 284 and the end of Roman rule in the Mediterranean. Comprises 39 essays from some of the world's foremost scholars of the era. Presents this once-neglected period as an age of powerful transformation that shaped the modern world. Emphasizes the central importance of religion and its connection with economic, social, and political life. A Companion to Late Antiquity. Wiley-Blackwell [Imprint], February 2012 Hoboken : John Wiley & Sons, Incorporated. MSU Online Resource (2012) : An accessible and authoritative overview capturing the vitality and diversity of scholarship that exists on the transformative time period known as late antiquity. Provides an essential overview of current scholarship on late antiquity from between the accession of Diocletian in AD 284 and the end of Roman rule in the Mediterranean. Comprises 39 essays from some of the world's foremost scholars of the era. Presents this once neglected period as an age of powerful transformation that shaped the modern world. Emphasizes the central importance of religion and its connection with economic, social, and political life. Oxford Dictionary of Byzantium via Oxford Reference Online (print copy also available) / Edited by Alexander P. Kazhdan. : With more than 5,000 entries by an international group of eminent historians, this is the standard research tool on 1,100 years of Byzantine history. Exhaustive in its coverage, entries on patriarchy and emperors coexist with entries on surgery, musical instruments, and the baking of bread, bringing to life this vastly important culture and empire, from the 4th century to the 15th. The Oxford handbook of Byzantine studies / edited by Elizabeth Jeffreys with John Haldon and Robin Cormack. Oxford ; New York : Oxford University Press, 2008. 1021pp. Main Library DF552 .O93 2008 : The Oxford Handbook of Byzantine Studies presents discussions by leading experts on all significant aspects of this diverse and fast-growing field. The Oxford Handbook of Byzantine Studies deals with the history and culture of the Byzantine Empire, the eastern half of the Late Roman Empire, from the fourth to the fourteenth century. Its centre was the city formerly known as Byzantium, refounded as Constantinople in 324 CE, the present-day Istanbul. Under its emperors, patriarchs, and all-pervasive bureaucracy Byzantium developed a distinctive society: Greek in language, Roman in legal system, and Christian in religion. Byzantium's impact in the European Middle Ages is hard to over-estimate, as a bulwark against invaders, as a meeting-point for trade from Asia and the Mediterranean, as a guardian of the classical literary and artistic heritage, and as a creator of its own magnificent artistic style. 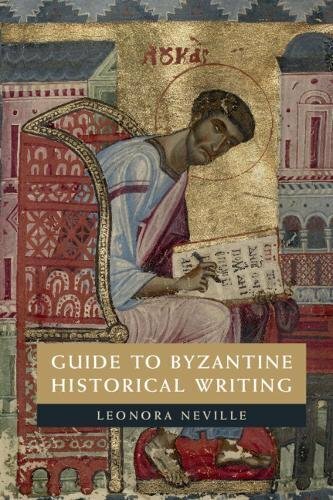 Guide to Byzantine Historical Writing / Leonara Neville. Cambridge University Press, 2018. 330pp. On order : This handy reference guide makes it easier to access and understand histories written in Greek between 600 and 1480 CE. Covering classicizing histories that continued ancient Greek traditions of historiography, sweeping, fast-paced 'chronicle' type histories, and dozens of idiosyncratic historical texts, it distills the results of complex, multi-lingual, specialist scholarship into clear explanations of the basic information needed to approach each medieval Greek history. It provides a sound basis for further research on each text by describing what we know about the time of composition, content covered by the history, authorship, extant manuscripts, previous editions and translations, and basic bibliography. Even-handed explanations of scholarly debates give readers the information they need to assess controversies independently. A comprehensive introduction orients students and non-specialists to the traditions and methods of Byzantine historical writing. It will prove an invaluable timesaver for Byzantinists and an essential entry point for classicists, western medievalists, and students. The Byzantine Commonwealth : Eastern Europe, 500-1453 / Dimitri Obolensky. London : Weidenfeld and Nicolson, 1971. 445 pages, 64 plates. Main Library DF552 .O25 (Also available online) : Makes important connections with Eastern Europe and Russia. The Byzantine World / edited by Paul Stephenson. Abingdon, England ; New York : Routledge, 2010. 606pp. Main Library DF521 .B9365 2010 : The Byzantine World presents the latest insights of the leading scholars in the fields of Byzantine studies, history, art and architectural history, literature, and theology. Those who know little of Byzantine history, culture and civilization between AD 700 and 1453 will find overviews and distillations, while those who know much already will be afforded countless new vistas. Each chapter offers an innovative approach to a well-known topic or a diversion from a well-trodden path. Readers will be introduced to Byzantine women and children, men and eunuchs, emperors, patriarchs, aristocrats and slaves. They will explore churches and fortifications, monasteries and palaces, from Constantinople to Cyprus and Syria in the east, and to Apulia and Venice in the west. Secular and sacred art, profane and spiritual literature will be revealed to the reader, who will be encouraged to read, see, smell and touch. The worlds of Byzantine ceremonial and sanctity, liturgy and letters, Orthodoxy and heresy will be explored, by both leading and innovative international scholars. Ultimately, readers will find insights into the emergence of modern Byzantine studies and of popular Byzantine history that are informative, novel and unexpected, and that provide a thorough understanding of both. Byzantium : the Apogee / John Julius Norwich. London : Viking, 1991. 389 pages, 32 unnumbered pages of plates. Main Library DF551 .N67 1991 : Describes Byzantium's battles against foreign threats, its internal conflicts, the return of iconoclasm in the ninth century, and the struggles between Anatolia's military aristocracy and the eunuchs of the capital. Byzantium : the Decline and Fall / John Julius Norwich. New York : Knopf, 1996. 448pp. Main Library DF601 .N67 1996 : For 1,123 years, Constantinople remained the capital of the Byzantine Empire -- the longest-lived and most continuously inspired Christian empire in the world. In this, the third and final volume of John Julius Norwich's magnificent and moving history, he tells of the dire consequences of the defeat by the Seljuk Turks at the battle of Manzikert in 1071; of the Fourth Crusade, whose Crusaders - led by the octogenarian Doge of Venice - turned their attention away from the Holy Places to hurl themselves against Constantinople, sacking the city and setting up a succession of Frankish thugs on the imperial throne; and of the two-hundred-year struggle by the restored Empire against the inexorable advance of the Ottoman Turks. Byzantium : the Early Centuries / John Julius Norwich. London : Viking, 1988. 407 pages, 32 unnumbered pages of plates. DF533 .N67 1988 : The first of a projected three-volume study, this elegantly written tribute to the Western debt to Byzantium traces the history of the city from the birth of Constantine c.274 to the coronation of Charlemagne on Christmas Day 800. While slight attention is given to ordinary people, and the approach is very Eurocentric, all the great figures of early Byzantine history are here; the architectural monuments, theological controversies, the notorious sexual tastes of many emperors, and the proverbially "Byzantine" court intrigues are lucidly described. Byzantium : the Surprising Life of a Medieval Empire / Judith Herrin. Princeton : Princeton University Press, 2008. 391 pages, 24 unnumbered pages of plates. Main Library DF521 .H477 2008 : Byzantium. The name evokes grandeur and exoticism -- gold, cunning, and complexity. In this unique book, Judith Herrin unveils the riches of a quite different civilization. Avoiding a standard chronological account of the Byzantine Empire's millennium -- long history, she identifies the fundamental questions about Byzantium -- what it was, and what special significance it holds for us today. Bringing the latest scholarship to a general audience in accessible prose, Herrin focuses each short chapter around a representative theme, event, monument, or historical figure, and examines it within the full sweep of Byzantine history -- from the foundation of Constantinople, the magnificent capital city built by Constantine the Great, to its capture by the Ottoman Turks. She argues that Byzantium's crucial role as the eastern defender of Christendom against Muslim expansion during the early Middle Ages made Europe -- and the modern Western world --possible. Herrin captivates us with her discussions of all facets of Byzantine culture and society. She walks us through the complex ceremonies of the imperial court. She describes the transcendent beauty and power of the church of Hagia Sophia, as well as chariot races, monastic spirituality, diplomacy, and literature. She reveals the fascinating worlds of military usurpers and ascetics, eunuchs and courtesans, and artisans who fashioned the silks, icons, ivories, and mosaics so readily associated with Byzantine art. An innovative history written by one of our foremost scholars, Byzantium reveals this great civilization's rise to military and cultural supremacy, its spectacular destruction by the Fourth Crusade, and its revival and final conquest in 1453. Byzantium, the empire of New Rome / Cyril Mango. New York : Scribner, , ©1980. 334 pages, 12 unnumbered leaves of plates. Main Library DF521 .M36 1980 : A fine interpretation of culture and art. A Cabinet of Byzantine Curiosities : strange tales and surprising facts from the world's most orthodox empire / Anthony Kaldellis. New York, NY : Oxford University Press,  236pp. Main Library DF521 .K295 2017 : Weird, decadent, degenerate, racially mixed, superstitious, theocratic, effeminate, and even hyper-literate, Byzantium has long been regarded by many as one big curiosity. According to Voltaire, it represented "a worthless collection of miracles, a disgrace for the human mind" for Hegel it was"a disgusting picture of imbecility. "A Cabinet of Byzantine Curiosities will reinforce these old prejudices, while also stimulating a deeper interest among readers in one of history's most interesting civilizations. Many of the zanier tales and trivia that are collected here revolve around the political and religious life of Byzantium.Thus, stories of saints, relics, and their miracles - from the hilarious to the revolting - abound. Byzantine bureaucracy (whence the adjective "Byzantine"), court scandals, and elaborate penal code are world famous. And what would Byzantium be without its eunuchs, whose ambiguous gender producedodd and risible outcomes in different contexts? The book also contains sections on daily life that are equally eye-opening, including food (from aphrodisiacs to fermented fish sauce), games such as polo and acrobatics, and obnoxious views of foreigners and others (e.g., Germans, Catholics, Arabs,dwarves). But lest we overlook Byzantium's more honorable contributions to civilization, also included are some of the marvels of Byzantine science and technology, from the military (flamethrowers and hand grenades) to the theatrical "elevator" thrones, roaring mechanical lions) and medical(catheters and cures, some bizarre). This vast assortment of historical anomaly and absurdity sheds vital light on one of history's most obscure and orthodox empires. Everyday Life in Byzantium / Tamara Talbot Rice. London : Batsford; New York : Putnams, 1967. 240pp. Main Library DF531 .R5 : Covers foundation and growth of the capital, the daily ritual of the imperial court and the church. Black & white illustrations throughout. The Grand Strategy of the Byzantine Empire / Edward N. Luttwak. Cambridge, Mass. : Belknap Press of Harvard University Press, 2009. 498pp. Main Library U163 .L86 2009 : In this book, the distinguished writer Edward Luttwak presents the grand strategy of the eastern Roman empire we know as Byzantine, which lasted more than twice as long as the more familiar western Roman empire, eight hundred years by the shortest definition. This extraordinary endurance is all the more remarkable because the Byzantine empire was favored neither by geography nor by military preponderance. Yet it was the western empire that dissolved during the fifth century. The Byzantine empire so greatly outlasted its western counterpart because its rulers were able to adapt strategically to diminished circumstances, by devising new ways of coping with successive enemies. It relied less on military strength and more on persuasion―to recruit allies, dissuade threatening neighbors, and manipulate potential enemies into attacking one another instead. Even when the Byzantines fought―which they often did with great skill―they were less inclined to destroy their enemies than to contain them, for they were aware that today’s enemies could be tomorrow’s allies. Born in the fifth century when the formidable threat of Attila’s Huns were deflected with a minimum of force, Byzantine strategy continued to be refined over the centuries, incidentally leaving for us several fascinating guidebooks to statecraft and war. The Grand Strategy of the Byzantine Empire is a broad, interpretive account of Byzantine strategy, intelligence, and diplomacy over the course of eight centuries that will appeal to scholars, classicists, military history buffs, and professional soldiers. A History of the Byzantine State and Society / Warren Treadgold. Stanford, Calif. : Stanford University Press, 1997. 1019pp. Main Library DF552 .T65 1997 : The first comprehensive and up-to-date history of Byzantium to appear in almost sixty years, and the first ever to cover both the Byzantine state and Byzantine society. It begins in A.D. 285, when the emperor Diocletian separated what became Byzantium from the western Roman Empire, and ends in 1461, when the last Byzantine outposts fell to the Ottoman Turks. Spanning twelve centuries and three continents, the Byzantine Empire linked the ancient and modern worlds, shaping and transmitting Greek, Roman, and Christian traditions--including the Greek classics, Roman law, and Christian theology--that remain vigorous today, not only in Eastern Europe and the Middle East but throughout Western civilization. Though in its politics Byzantium often resembled a third-world dictatorship, it has never yet been matched in maintaining a single state for so long, over a wide area inhabited by heterogeneous peoples. Drawing on a wealth of original sources and modern works, the author treats political and social developments as a single vivid story, told partly in detailed narrative and partly in essays that clarify long-term changes. He avoids stereotypes and rejects such old and new historical orthodoxies as the persistent weakness of the Byzantine economy and the pervasive importance of holy men in Late Antiquity. Without neglecting underlying social, cultural, and economic trends, the author shows the often crucial impact of nearly a hundred Byzantine emperors and empresses. What the emperor or empress did, or did not do, could rapidly confront ordinary Byzantines with economic ruin, new religious doctrines, or conquest by a foreign power. Much attention is paid to the complex life of the court and bureaucracy that has given us the adjective "byzantine." The major personalities include such famous names as Constantine, Justinian, Theodora, and Heraclius, along with lesser-known figures like Constans II, Irene, Basil II the Bulgar-Slayer, and Michael VIII Palaeologus. Byzantine civilization emerges as durable, creative, and realistic, overcoming repeated setbacks to remain prosperous almost to the end. With 221 illustrations and 18 maps that complement the text, A History of the Byzantine State and Society should long remain the standard history of Byzantium not just for students and scholars but for all readers. A History of Byzantium / Timothy E. Gregory. Malden, MA ; Oxford : Blackwell Pub., 2005. 382pp. Main Library DF552 .G68 2005 : A concise narrative of Byzantine history from the time of Constantine the Great (AD 306) to the fall of Constantinople in 1453. Argues that Byzantium was important in its own right but also served as a bridge between East and West and ancient and modern society. Uses the chronological political history of the empire as a narrative frame. Considers social and economic life and the rich culture of the Byzantine Empire. Integrates visual documents, such as photographs of art, architecture, and implements from daily life. Makes the latest scholarship accessible to a wide audience. Includes a chronological list of emperors, a glossary and maps. The Last Centuries of Byzantium, 1261-1453 / Donald M. Nicol. Cambridge ; New York : Cambridge University Press, 1993. 2nd edition, 463pp. Main Library DF631 .N5 1993 : The Byzantine Empire, fragmented and enfeebled by the Fourth Crusade in 1204, never again recovered its former extent, power and influence. Its greatest revival came when the Byzantines in exile reclaimed their capital city of Constantinople in 1261 and this book narrates the history of this restored empire from 1261 to its conquest by the Ottoman Turks in 1453. Lost to the West : the Forgotten Byzantine Empire That Rescued Western Civilization / Lars Brownworth. New York : Crown Publishers,  329pp. Main Library DF552 .B76 2009 : In AD 476 the Roman Empire fell-or rather, its western half did. Its eastern half, which would come to be known as the Byzantine Empire, would endure and often flourish for another eleven centuries. Though its capital would move to Constantinople, its citizens referred to themselves as Roman for the entire duration of the empire's existence. Indeed, so did its neighbors, allies, and enemies: When the Turkish Sultan Mehmet II conquered Constantinople in 1453, he took the title Caesar of Rome, placing himself in a direct line that led back to Augustus. For far too many otherwise historically savvy people today, the story of the Byzantine civilization is something of a void. Yet for more than a millennium, Byzantium reigned as the glittering seat of Christian civilization. When Europe fell into the Dark Ages, Byzantium held fast against Muslim expansion, keeping Christianity alive. When literacy all but vanished in the West, Byzantium made primary education available to both sexes. Students debated the merits of Plato and Aristotle and commonly committed the entirety of Homer's Iliad to memory. Streams of wealth flowed into Constantinople, making possible unprecedented wonders of art and architecture, from fabulous jeweled mosaics and other iconography to the great church known as the Hagia Sophia that was a vision of heaven on earth. The dome of the Great Palace stood nearly two hundred feet high and stretched over four acres, and the city's population was more than twenty times that of London's. From Constantine, who founded his eponymous city in the year 330, to Constantine XI, who valiantly fought the empire's final battle more than a thousand years later, the emperors who ruled Byzantium enacted a saga of political intrigue and conquest as astonishing as anything in recorded history. Lost to the West is replete with stories of assassination, mass mutilation and execution, sexual scheming, ruthless grasping for power, and clashing armies that soaked battlefields with the blood of slain warriors numbering in the tens of thousands. Still, it was Byzantium that preserved for us today the great gifts of the classical world. Of the 55,000 ancient Greek texts in existence today, some 40,000 were transmitted to us by Byzantine scribes. And it was the Byzantine Empire that shielded Western Europe from invasion until it was ready to take its own place at the center of the world stage. Filled with unforgettable stories of emperors, generals, and religious patriarchs, as well as fascinating glimpses into the life of the ordinary citizen, Lost to the West reveals how much we owe to this empire that was the equal of any in its achievements, appetites, and enduring legacy. The Making of Byzantium, 600-1025 / Mark Whittow. Berkeley : University of California Press,  477pp. Main Library DF556 .W45 1996 (Also available online) : A clear, up-to-date reassessment of the Byzantine empire during a crucial phase in the history of the Near East. Against a geopolitical background (superbly illustrated with fourteen maps), his book covers the last decade of the Roman empire as a superpower, the catastrophic crisis of the seventh century, and the means whereby the embattled Byzantine empire hung on in Constantinople and Asia Minor until the Abbasid Caliphate's decline opened up new perspectives for Christian power in the Near East. A special feature is Whittow's coverage of Byzantium's neighbors, allies, and enemies in Europe and Asia. He stresses the geographical context of events, often overlooked in other accounts of this period. The origins of Russia, relations with the nomad powers of the steppe world, the competition between Bulgars, Romans, and Slavs in the Balkans, and the frequently ignored region of the Transcaucasus are all given extended treatment. Mediterranean World in Late Antiquity, 395-700 AD / Averil Cameron. Abingdon, Oxon ; New York : Routledge, 2012. 300pp. Main Library DE71 .C25 2012 : This thoroughly revised and expanded edition of The Mediterranean World in Late Antiquity, now covering the period 395-700 AD, provides both a detailed introduction to late antiquity and a direct challenge to conventional views of the end of the Roman empire. Leading scholar Averil Cameron focuses on the changes and continuities in Mediterranean society as a whole before the Arab conquests. Two new chapters survey the situation in the east after the death of Justinian and cover the Byzantine wars with Persia, religious developments in the eastern Mediterranean during the life of Muhammad, the reign of Heraclius, the Arab conquests and the establishment of the Umayyad caliphate. Using the latest in-depth archaeological evidence, this all-round historical and thematic study of the west and the eastern empire has become the standard work on the period. The new edition takes account of recent research on topics such as the barbarian 'invasions', periodization, and questions of decline or continuity, as well as the current interest in church councils, orthodoxy and heresy and the separation of the miaphysite church in the sixth-century east. It contains a new introductory survey of recent scholarship on the fourth century AD, and has a full bibliography and extensive notes with suggestions for further reading. The Mediterranean World in Late Antiquity 395-700 AD continues to be the benchmark for publications on the history of Late Antiquity and is indispensible to anyone studying the period. Suda On Line: Byzantine Lexicography. Certain fundamental sources for the study of the ancient world are currently accessible only to a few specially trained researchers because they have never been provided with a sufficiently convenient interpretive apparatus or, in some cases, even translated into modern languages. The Suda On Line project attacks that inaccessibility by engaging the efforts of scholars world-wide in the translation and annotation of a substantial text that is being made available exclusively through the internet. We have chosen to begin with the Byzantine encyclopedia known as the Suda, a 10th century CE compilation of material on ancient literature, history, and biography. A massive work of about 30,000 entries, and written in sometimes dense Byzantine Greek prose, the Suda is an invaluable source for many details that would otherwise be unknown to us about Greek and Roman antiquity, as well as an important text for the study of Byzantine intellectual history. Byzantium : Byzantine Studies on the Internet. Courtesy of Fordham University.